Kyle Barker with Posh manager Darren Ferguson. Photo: Joe Dent/theposh.com. Peterborough United Academy graduate Kyle Barker has had the perfect tutor this season. One of the best Posh players of all time - and fellow Posh Academy graduate - Simon ‘Digger’ Davies, a Welsh international who also played for Spurs, Everton and Fulham, was appointed to the youth team coaching staff and his knowledge of the midfield role was invaluable in helping Barker (18) to earn his first professional contract. Posh youth team coach Simon 'Digger' Davies (right). Photo: Joe Dent/theposh.com. “I’ve learnt a lot from Simon,” Barker, who hails from King’s Lynn, admitted. “He’s had a huge impact on my game this season. He’s given me a lot to work on and it’s all been really helpful. “It’s a dream come true to get this first professional contract and I’m really grateful to Darren Ferguson and the Academy staff for giving me the opportunity. “But the first-team manager told me that the hard work starts now and he’s right. “I’m nowhere near ‘making it’ yet and I will crack on in the summer and hope I can catch his eye. “It’s been a much better season for the youth team. It’s about performance as well as results at this level, but it’s always good to win games. “The under 23 games have been useful in my development. Playing with and against senior professionals is a great experience. 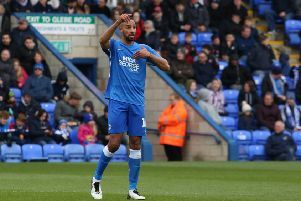 “I’ve been on loan at Lowestoft as well which has also helped me. “The physical side of football is full on in non-league. It’s all about winning at the level. Posh have released all their second-year under 18 scholars from this season with the exception of midfielders Harrison Burrows and Barker who have both earned professional deals. Included among those to be released are assistant manager Gavin Strachan’s son Luke. Others to leave are Jack Gurney, Oli Shackleton, Fraser Garner, Harry Brookes and Rio Douglas. They all played a part in a decent run to the fourth round of the FA Youth Cup and a second-placed finish in the Youth Alliance East Division. 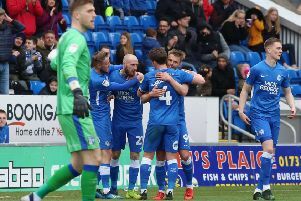 Posh have been fielding a younger team in the Merit One League and they again performed well last weekend when drawing 3-3 with Luton despite playing the entire second-half with 10 men. Ricky Jade-Jones, Brad Rolt and Shaun Keane scored for a team that included three under 15 players. Posh Academy staff have been given a target of producing three first-team standard players every season by the year 2024.